Brentwood Town progress to the second qualifying round of the FA Trophy, as they won 2-0 against Aylesbury in the replay at the Arena. A goal in each half secured their place in the next round, through Craig Reid’s strike 13 minutes in. Brentwood doubled their lead with nine minutes remaining after Richardson was brought down inside the box and Liam Hope slotted in to secure Brentwood’s place in the next round. Dean Holdsworth made three changes to his side that played in the 1-1 draw at Aylesbury on Saturday. Philip Anderson, Sam Lechmere and Jamie Guy were replaced by Liam Hope, Tom Richardson and Laurence Vaughan. Brentwood started brightly and almost opened the scoring three minutes in as a half clearance from Aylesbury came to Nicky Symons on the volley, which stung the hands of James Weatherill. Tom Richardson intercepted the ball in the Aylesbury half and burst goalwards, his shot was originally spilled by Weatherrill but was eventually collected. ‘The Blues’ took the lead 14 minutes in, after Mitch Hahn raced down the left flank and cut the ball to Reid to steady himself and fire his shot into the bottom corner. Aylesbury had a glorious chance to equalise 22 minutes in, as Ken Feyi was played in on goal. Paul Goodacre stalled his run under pressure but Feyi won the ball back and his shot on the turn hit the side netting. The Evo-Stik Southern Division One side had another opportunity, as James Dobson clipped a ball towards the far post for Brian Haule to head just wide of the far post. Richardson again caused the Aylesbury defence problems, as he out muscled Dobson but his snap shot went wide. In the second half, Aylesbury nearly equalised 53 minutes in. Gareth Price arrowed in a fierce cross for Feyi who turned it goalwards but hit the crossbar from inside the six-yard box. The visitors squandered another chance for a leveller, as substitute Ryan O’Toole was slotted in on goal but his shot with just Martyn Guest to beat was put wide. Brentwood could have doubled their lead 73 minutes in, as the ball was given to Hahn on the edge of the box but his low shot was saved by Weatherill. ‘The Blues’ were again in search of a second goal and almost got it, as substitute Jamie Guy crossed the ball to the far post for Brentwood’s second substitute Sam Lechmere, which he headed wide. Brentwood were awarded a penalty 81 minutes in, after Richardson fought his way into the box but was brought down by Dobson. Liam Hope then stepped up and coolly converted to book Brentwood’s place into the next round. Brentwood Town will now travel away to face Evo-Stik Southern Premier side Bideford AFC in the second qualifying round of the FA Trophy Saturday week. 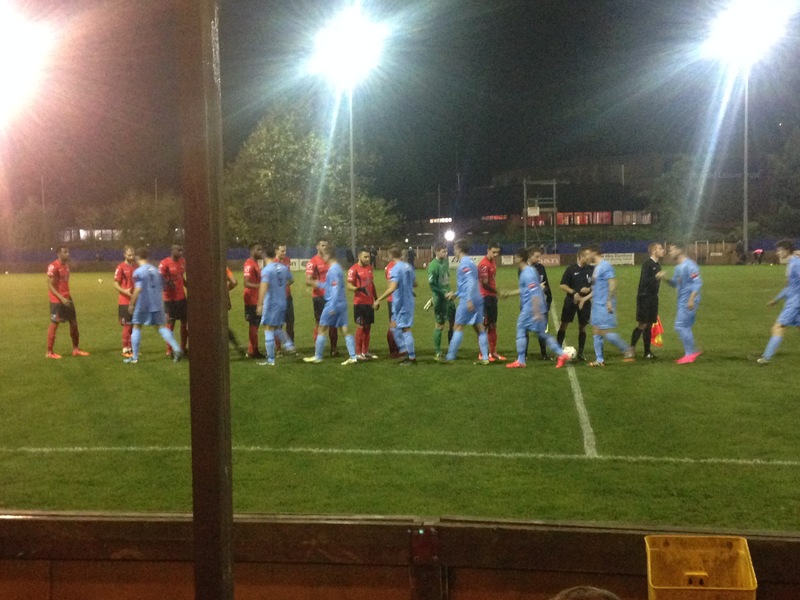 This entry was posted in Football, Sport and tagged Brentwood, Brentwood Town, Brentwood Town vs Aylesbury, FA Trophy.